This CellML model runs in PCenv, COR and OpenCell to recreate the published results. This model only describes the standalone SERCA pump, and is based on the original matlab code dy_buffering_serca. Other versions of this model couple the SERCA pump to a reduced cardiac myocyte model. ABSTRACT: When developing large-scale mathematical models of physiology, some reduction in complexity is necessarily required to maintain computational efficiency. A prime example of such an intricate cell is the cardiac myocyte. For the predictive power of the cardiomyocyte models, it is vital to accurately describe the calcium transport mechanisms, since they essentially link the electrical activation to contractility. 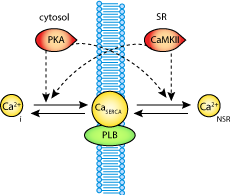 The removal of calcium from the cytoplasm takes place mainly by the Na(+)/Ca(2+) exchanger, and the sarcoplasmic reticulum Ca(2+) ATPase (SERCA). In the present study, we review the properties of SERCA, its frequency-dependent and beta-adrenergic regulation, and the approaches of mathematical modelling that have been used to investigate its function. Furthermore, we present novel theoretical considerations that might prove useful for the elucidation of the role of SERCA in cardiac function, achieving a reduction in model complexity, but at the same time retaining the central aspects of its function. Our results indicate that to faithfully predict the physiological properties of SERCA, we should take into account the calcium-buffering effect and reversible function of the pump. This 'uncomplicated' modelling approach could be useful to other similar transport mechanisms as well. Schematic diagram of SERCA pump. Derived from workspace Koivumaki,2009 at changeset 882b85019849.